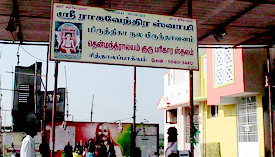 Mantralaya Aachariyar conducted regular poojas for the sithalapakkam Brindavan mirthigai. In 48 days special poojas Mantralaya mirthigai was worshiped. At Bhrama Mugurtham, Mantralaya Aachariyar kept the mirthigai over his head and placed it with celebration and incidental music in Brindavan. Therefore it is termed as Mirthiga Brindavan- to enlighten the Gururaj Brindavan, kumbaabishegam was done beautifully. Meanwhile an eagle from above came near the Gopura kalasam and revolved around it 3 times. Seeing that, all the people exclaimed ‘Narayana’, ‘Raghavendra’!!! The uppermost part of the Gopura kalasam is the statue of Nagaraj with his eagle which is four facet. The Gururaj Brindavan provides all blessings and goodness and hence it is called as ‘Nala Brindavan’.